Tom zawiera zbiór około 50 opracowań wielu autorów różnych specjalności z głównych ośrodków naukowych i dotyczy wybranych aspektów związanych z roślinnością borów i ich siedliskami na obszarach Polski, Litwy i Finlandii. Stanowi podsumowanie długoletnich, oryginalnych badań. 4) Rośliny naczyniowe, mchy, porosty i grzyby wyższe w borach i na ich siedliskach - wybrane problemy. Książka, napisana w języku angielskim, zawiera bogatą dokumentację faktograficzną w postaci tabel, zestawień porównawczych, rycin i fotografii. On the systematics of coniferous forests. The coniferous forest communities of the Seili Island in SW Finland . Notes on the diversity and distribution of communities of the Vnccinio-Piceetea class in Lithuania. Differentiation of the coniferous forest associations in the Słowiński National Park. Vaccinia uliginosi-Betuletum pubescentis Libbert 1933 in the Czapłowizna nature reserve, Lochow Primeval Forest. Sphagna girgensohnii-Piceetum Polakowski 1962 in the Jegiel nature reserve near Łochów (Eastern Poland). The silver fir Abies alba Mill, in the communities of the Vaccinio-Piceetea class in the Południowopodlaska Lowland. The upland spruce-fir mixed forest Abietetum albae Dziubaltowski 1928 in the Forest Promotional Complex "Lasy Rychtalskie". The occurrence of subcontinental mixed coniferous forests on the Rychwal Plain (Eeastern Wielkopolska) - some remarks. Floristic and ecological differentiation of the association Calamagrostio villosae-Pinetum Staszkiewicz 1958 in Poland. The protection of the coniferous forests in the nature reserves of the Silesian voivodeship. Fires in the long-term dynamics of pine subcontinental forests. The problem of the naturalness of pine forests - case study Jaksonek nature reserve on the Pilica River. Selected aspects of differentiation of vegetation of the Leucobryo-Pinetum dynamic circle. Festuco ovinae-Hypnetum jutiandici - the moss-rich heath developing under the influence of moderate treading of pine forests. Sigmassociations of the vegetation dynamic circles of Vaccinio uliginosi-Betuletum pubescentis and Vaccinia uliginosi-Pinetum in chosen areas of the Western Pomeranian Province. The character, range and causes of changes in coastal pine forests on the Polish Baltic Coast. Vegetation succession on forested and unforested habitats on coastal dunes of the Świna Gate Barrier. Secondary succession in pine monocultures of abandoned farmlands. The composition of the herb layer of managed spruce forests in the Beskid Żywiecki range. Phytosociological and ecological characteristics of plant communities occurring on dead trees in coniferous forests of the Babia Góra massif. Vegetation of early stages of succession on sandy post-cultivated lands - selected examples. Segetal communities from the dynamic circles of coniferous pine forests of the alliance Dicrano-Pinion in the Siedlce Upland - occurrence and degree of threat. The encroachment of spruce onto anthropogenically eroded sites . The encroachment of Scots pine Pinus sylvestris L. on the area of former sand exploitation in the Eastern Silesian Upland. Spontaneous regeneration of Scots pine Pinus sylvestris L. in mesic mixed coniferous forest in the Forest Inspectorate Gubin. A response of pine forests to the cessation of tending and other sylvicultural treatments. Changes in the density and spatial structure of trees in pine stands planted at different initial spacing. The possibilities and justification for application of Scots pine natural regeneration on coniferous forest sites. 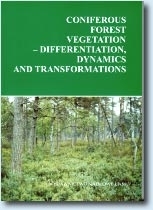 Transformations of coniferous forest vegetation as a result of forest management. Maps of real and potential natural forest vegetation of the Słowiński National Park. Coniferous mixed mesic forest as an example of divergence between a forest site type and a unit of potential natural vegetation. Forest communities with silver fir Abies alba Mill, participation versus forest habitat types in the area of the Beskid Mały range. Some floristic and habitat peculiarities of the coastal pine forests Empetro nigri-Pinetum Libb. et Siss. in Libb. 1940 em. Wojt. 1964 nom. ivers. Chosen features of Goodyera repens (L.) R. Br. populations in coniferous forests of the Południowopodlaska Lowland. The common yew Taxus baccata L. share in Querco roboris-Pinetum (W. Mat. 1981) J. Mat. 1988 in Poland. The participation of invasive alien plants in the degeneration of coniferous forests of the Silesian Upland. Natural and anthropogenic coniferous forest communities of the Wapienica Valley and their role in maintaining populations of protected and rare plants. The herb layer diversity and the occurrence of rare and protected vascular plant species in the pine forest Leucobryo-Pinetum in the Olkusz Upland. Protected plands of coniferous forests of the Silesian Beskid. Intrapopulational differentiation of the Scots pine Finns sylvestris L. population from Tuchola Forests expressed in anatomical traits of needles. The lichens of pine forests in the vicinity of Siedlce. Macromycetes in phytocoenoses at the upper forest limit and in the dwarf pine zone in the Babia Gora massif (Western Carpathians). Basidiomycetes of coniferous forest communities in the Góry Świetokrzyskie Mts.